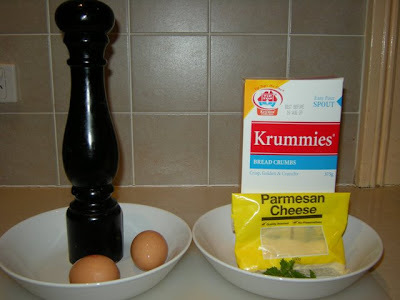 And now, the moment you’ve all been waiting for … another picture recipe! I had so much fun doing the last one, and had such a great response to it, that I’ve been trying to think up another recipe to try another one. 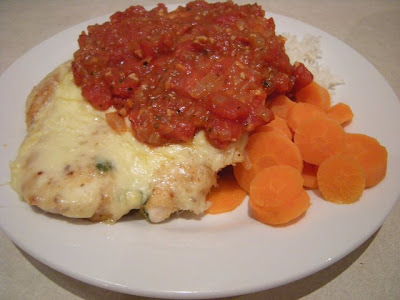 And here it is: Chicken Parmigiana. 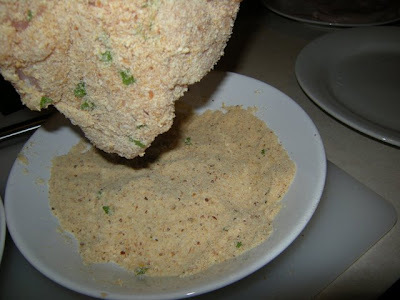 This is my own recipe, that I’ve developed over quite a few years now. It goes from scratch, so it’s a bit time consuming, but it really is very easy. Don’t get scared off by the crumbing and everything, it’s actually a lot of fun. 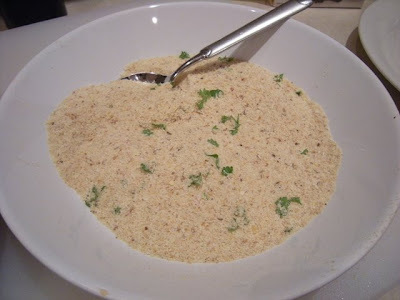 Of course, this recipe does lend itself to cheating shortcuts quite easily. 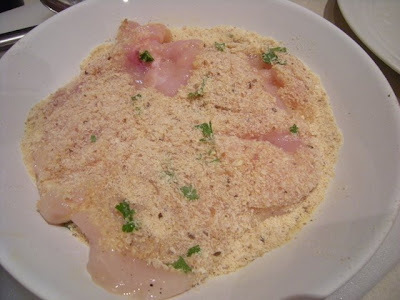 You could buy pre-crumbed chicken schnitzels from your butcher, or forget the crumbs and use grilled chicken breasts. I’ve also been known to do a quick and dirty oven-baked version (throw plain chicken breasts in a casserole dish, stick some cheese on top, and then drizzle a tin of tomatoes around the edges. Lid on and bake for 45 minutes at 180 degrees and it’s done). Whatever shortcuts work for you, I beg you to just try the long version once. You won’t regret it. 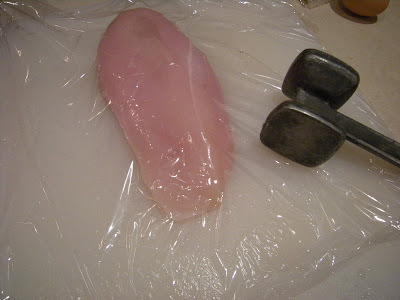 Chicken breasts! I’m making three. Trim off the white fat. 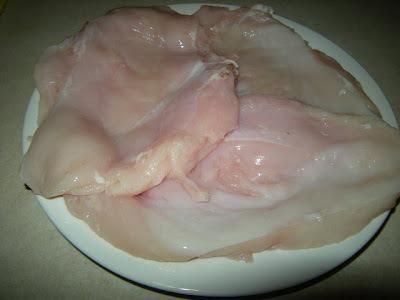 If you got full chicken breasts from your butcher, then remove the little piece of cartiledge from in between as well. 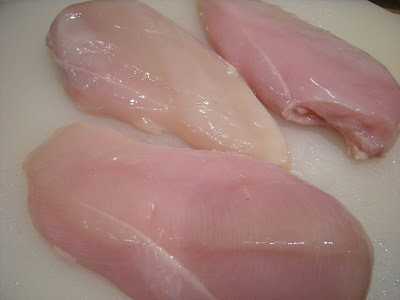 Also, if your butcher leaves the tenderloins attached to the breasts, chop them off now and put them aside. We’ll use them later. 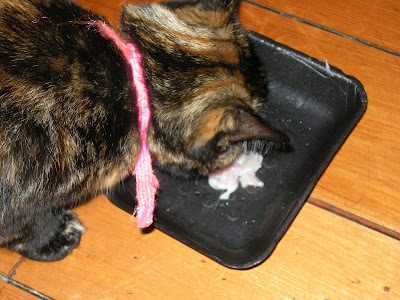 Feed the scraps to the cat. This is Missy. She likes chicken parmigiana too, it seems. 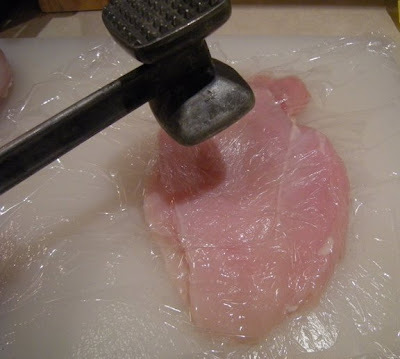 Start pounding with the flat side of your meat mallet. You need to put a bit of force behind the mallet, but don’t bash the hell out of it. Start at the fattest part of the breast, and don’t hit in the same place twice in a row. Move the mallet around in circles, working your way out towards the thinner parts, then starting again in the middle. 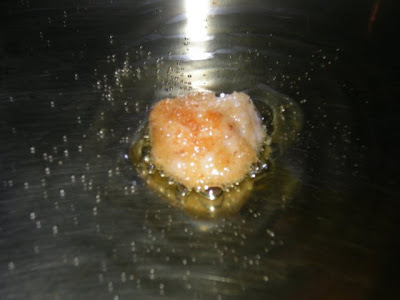 As the breast gets thinner, you’re more likely to end up with holes in it if you bash too hard, so lighten up a little, and start working on getting it nice and even all over. Ideally, you want it about half to one centimetre thick all over. 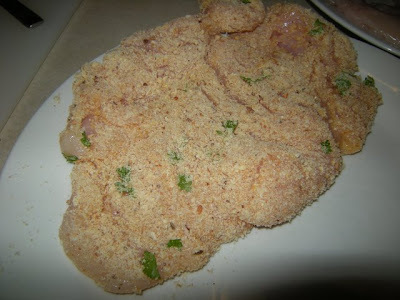 Too thick and the crumbs will burn before the chicken is cooked, too thin and the chicken will be overdone before the crumbs are golden. There’s a bit of a knack to this, and practise is the only sure fire way to master it, unfortunately. Let’s get ready to crumb! You will need two wide, shallow bowls. Pasta bowls are perfect. On the left, we have two eggs and some fresh pepper. 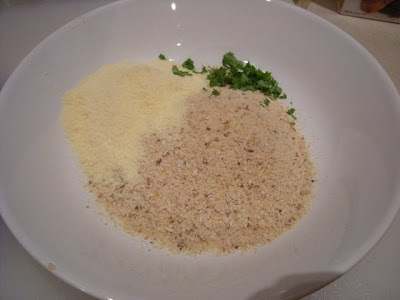 On the right, we have breadcrumbs (fresh or dried, it’s up to you, dried will make a crisper crumb), parmesan cheese (not nice fresh cheese, either, that horrid dried out stuff that we used to put on our pasta as kids. Believe me, it’ll work), and some fresh parsley. 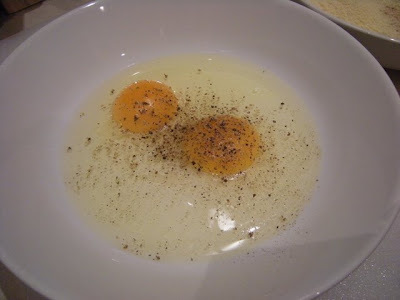 You can also add a bit of paprika to the eggs, if you so desire. And whisk it up until it’s well combined. 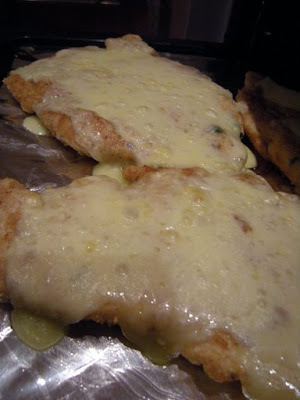 Now pour in a good amount of breadcrumbs, and a slightly lesser amount of stinky cheese. Chop up the herbs with your scissors, you can keep it pretty chunky. You could also use chives or basil at this point. I would grab whatever Italian-style herbs you have growing fresh. Dried herbs will not work well here, as it will spoil the look of the final product. Now comes the messy part! Wash your hands, and then grab the first chicken breast. 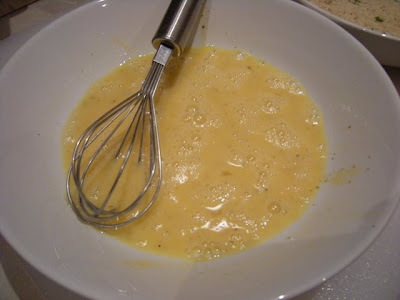 Dunk it into the egg, and then flip it over to cover the other side. We’re not bothering with flouring or any of that stuff, because we only want a light crumb. Besides, it’s way too much mucking around for my liking. Let the excess drip off, but not too much. You need it nice and damp for the crumbs to stick. Dump it into the crumbs. And then flip it over. Use your fingers to cover the bits that got missed out. You might find that flipping it over a few times helps to get it all covered. 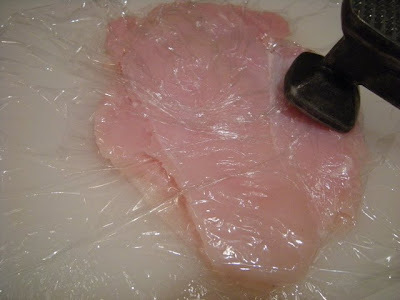 And pop it aside while you crumb the remaining chicken. 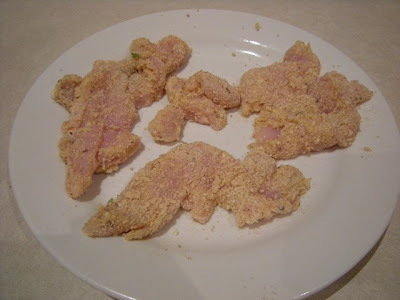 Now here are our tenderloins again. I coat them in whatever crumbs are left. Doesn’t matter if they’re a bit patchy. 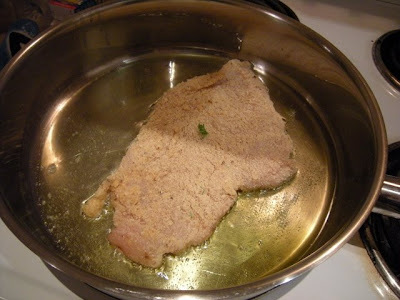 I like to use equal parts olive oil and rice bran oil for shallow frying. 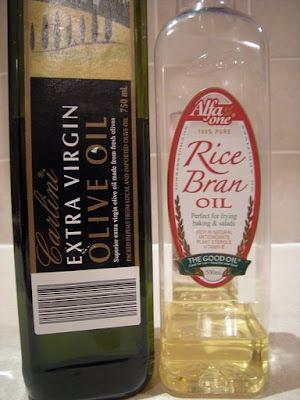 Rice bran oil has a low smoking point, so it’s perfect for this type of cooking. Extra virgin olive oil has that wonderful flavour that you expect from good Italian cooking. 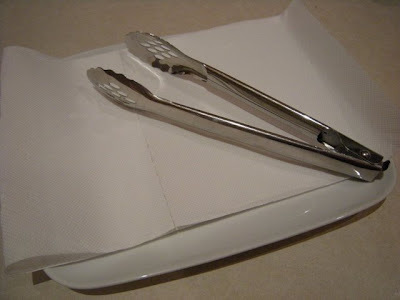 Get your tongs out, and put some paper towel on a tray. You don’t need them yet, but when you do, you’re going to need them in a hurry. Make like a boy scout. 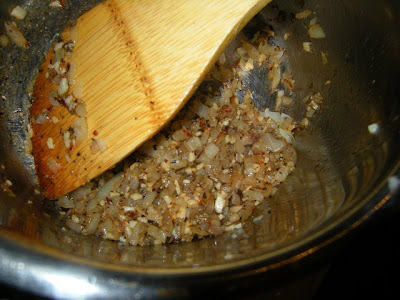 Back to the oil … this combination also makes a lovely colour blend in the frying pan. 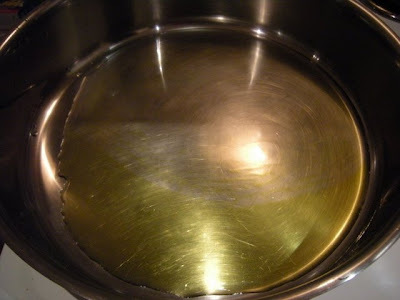 You’ll need your pan over a moderate heat. 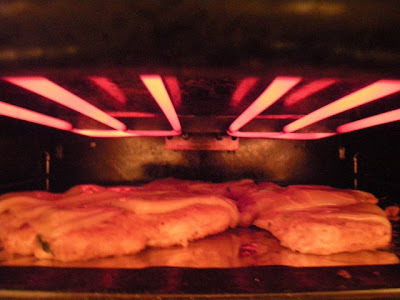 Don’t be afraid to adjust it slightly as you’re cooking if things seem to be a little cool (not browning properly) or too hot (skipping straight over golden brown and going straight to burnt umber). 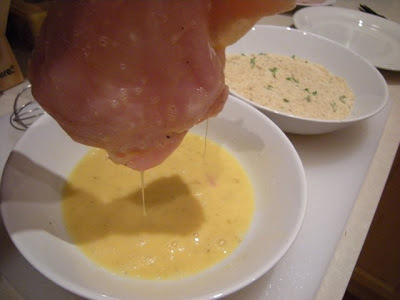 Find a small piece of chicken to use as a temperature gauge, and drop it into the oil once it’s started to heat up. How long this takes has a lot to do with what type of cooktop you have, and how heavy your saucepan is. I’m using a heavy-based pan on an electric stovetop, so it’s gonna take a while. 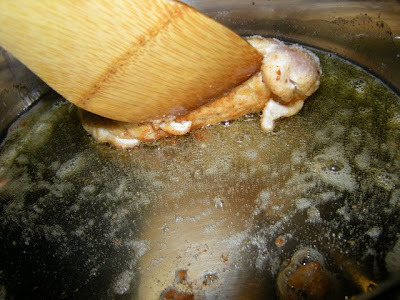 Standard caveat applies though – never walk away from oil on the stove. It’s nearly always a Very Bad Idea. 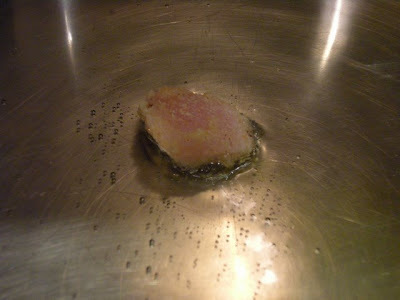 OK, we’re starting to get more bubbles on the base of the pan, and a few little ones forming around the piece of meat. Alright! 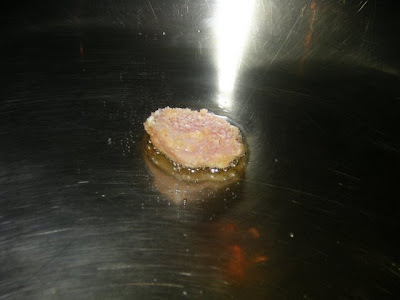 Now we’ve got some lovely big bubbles around the meat, causing ripples across the surface of the oil. There’s also lots more little ones on the base. Flip over your test piece of chicken, give it a little sizzle on the other side, and then eat it while no one else is looking. I’ll just be over here while you do that. 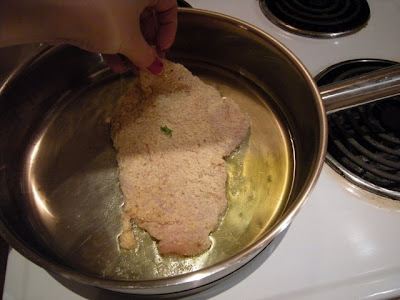 Use your hands, and gently drape the chicken into the hot oil. Resist the temptation to shuffle it all about, and just wait for about 3-5 minutes. Then you can get your spatula out and have a sneak peak underneath. If it’s a lovely golden brown colour, then loosen it off the bottom of the pan with your spatula (it should come easily). Slide the spatula underneath one end and grab those tongs (told you you would need them in a hurry, didn’t I?) to hang on to the other end and flip it over. Trust me, you need the tongs. 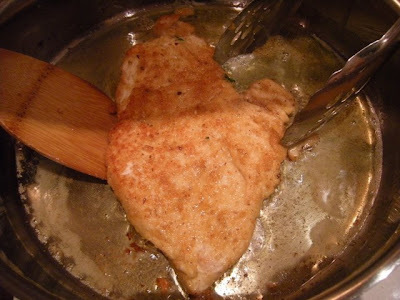 When you lose the chicken breast off your spatula and it splashes back into the boiling oil, it’s not pretty. Trust me on this one, OK? Cook it for a few minutes on the other side. 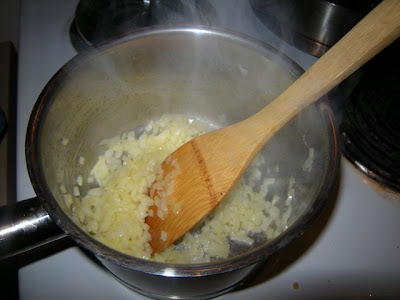 Once it’s cooked on both sides, do your spatula-and-tongs maneuver again, and place it gently on to the paper towel. Stand back and admire this thing of beauty. 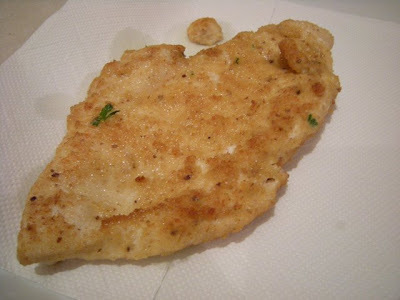 Just-done chicken, a lovely light crumb, flecks of fresh herbs, and a beautiful golden colour. Try not to eat it just yet. 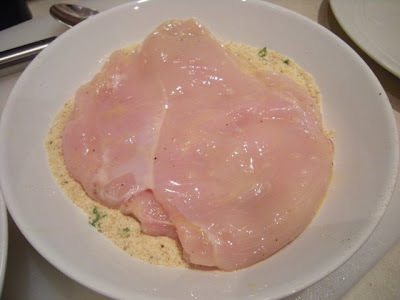 Cook the rest of your breasts, and then throw those tenderloins in. I generally have people hovering around in the kitchen at this point. Warn the kids that they’re hot, and then watch them burn the roof of their mouths with them. Hours of entertainment! 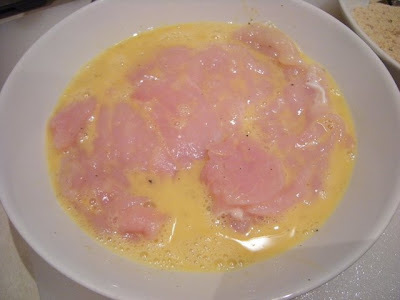 You can leave your beautiful schnitzels aside for a while so you can get on with the sauce. Don’t worry about them getting cold, we haven’t finished with them yet. 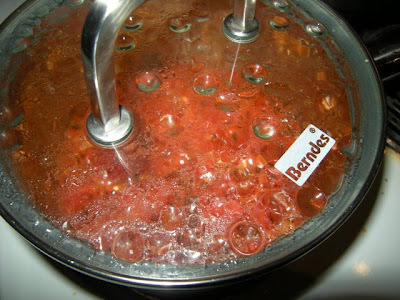 And now, the sauce! Here’s the cast of characters: marjoram, basil (dried is fine, fresh is better of course), minced garlic (again, use fresh if you have the energy. 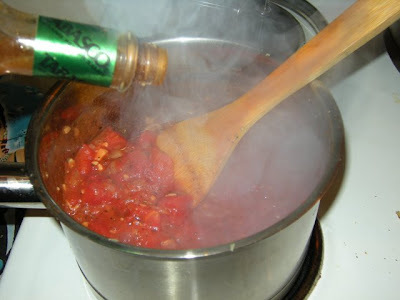 A single clove roughly chopped is ideal), a tin of diced tomatoes, piri piri (or any other chilli you desire. I find the piri piri blend perfect for this though), and some tabasco for those who like it hot. Oh, and an onion. We’ll only be using half for this recipe. Pop the other half in a plastic bag and stick it in the fridge. It’ll keep up to about a week. 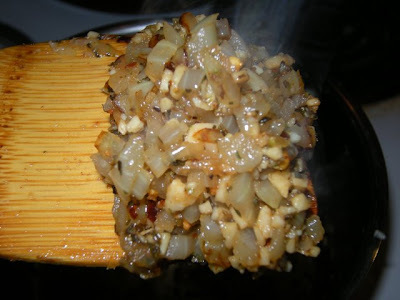 We want the onion as finely sliced as possible. 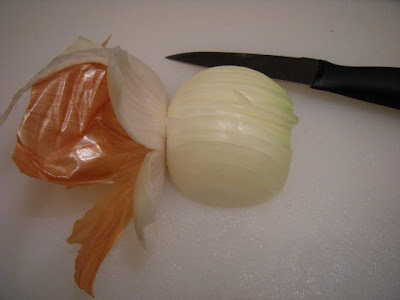 Cut the onion in half from top to bottom, and then cut the top off. Leave the bottom on, and peel the skin back, this will give you something to hold on to. 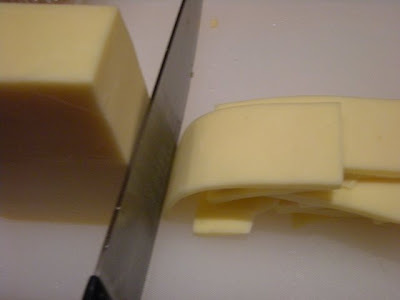 Use a very sharp paring knife to make as fine slices as you can, leaving the very bottom intact. 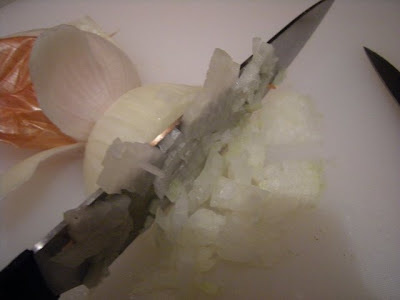 Grab your chef’s knife, and cut the onion crossways to create a fine dice. 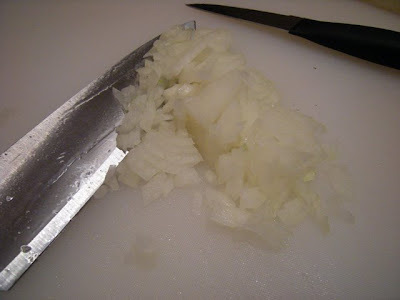 You can cut across the onion a few more times if you want it a bit finer. 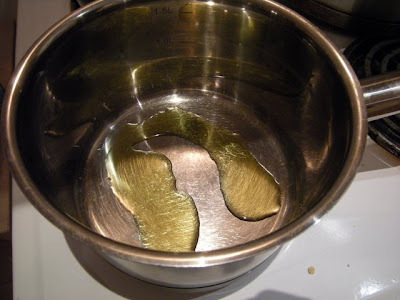 Put a small saucepan over a high heat, and slurp in some olive oil. And the onion and stir, stir, stir. 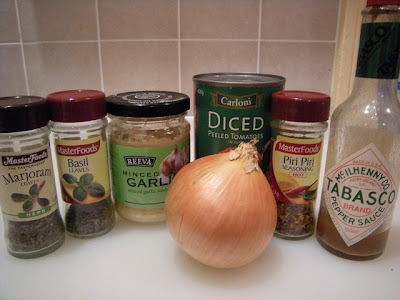 When the onion is completely cooked, and the bottom of the pan has started to get some colour, add the herbs, the garlic, and the piri piri. 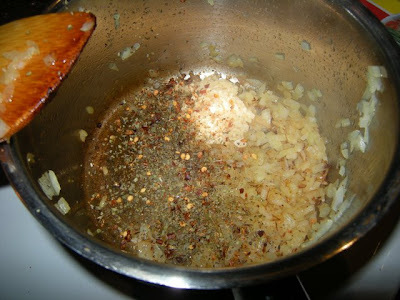 Stir it all around, until the herbs start to smell absolutely delicious. Here it is … a lovely chunky herby oniony mess. It smells divine. And looks awful. And stir it all about. Add as much as Tabasco as you dare. 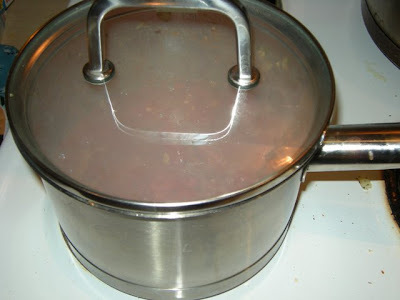 Drop the heat to low, and put the lid on. Ignore it until you’re nearly ready to put it on the plates. 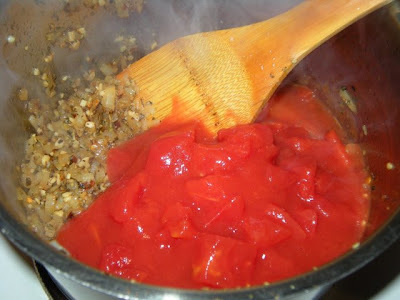 The purpose of simmering it so long is to get the tomato pieces to break down as much as possible, and to get the flavours right through the sauce. 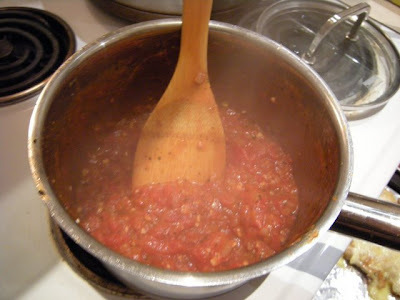 If you don’t simmer it like this, you end up with big tomatoey chunks that taste particularly boring. 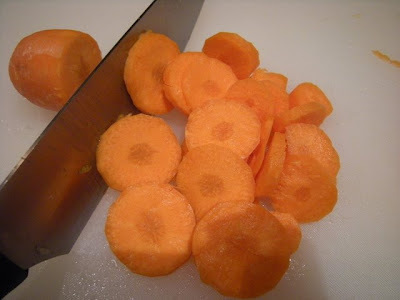 Chop up some carrots, or whatever veggies you like. I just gave these a quick steam in the microwave. 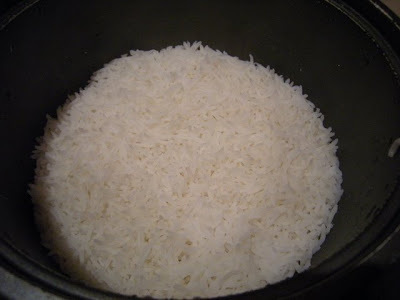 And here’s some rice! Magic! 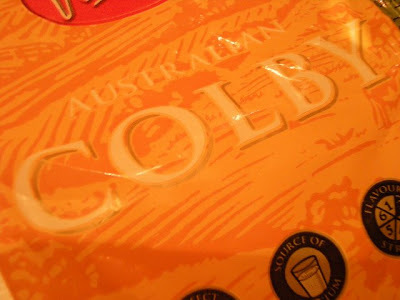 For melting, you really can’t beat Colby. Having said that, you can use pretty much any hard, tasty cheese you like. The only thing I would categorically avoid is that horrid manufactured stuff that comes in slices. It’s really not suitable for anything other than putting in kids’ lunchboxes. Or throwing at people. 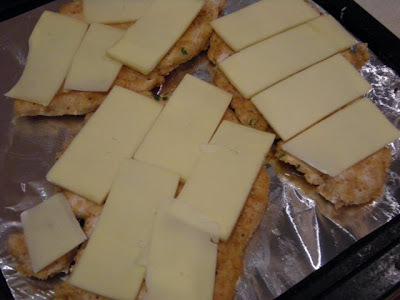 Transfer your chicken to the grill tray, and scatter the cheese all over it. Pop it under the grill on a high heat. 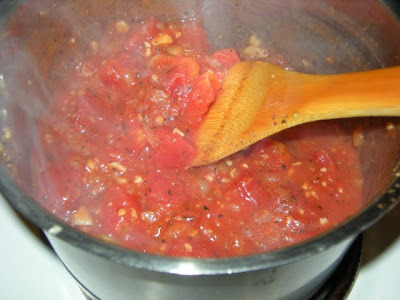 Our sauce is starting to look lovely. It’s been simmering for about 15-20 minutes now, while the rice was cooking. 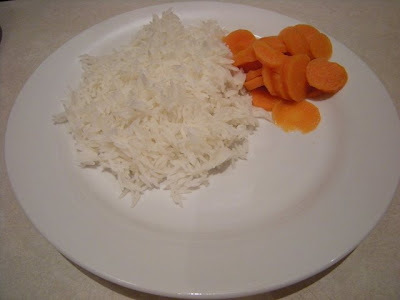 Plate the rice and the veggies. Yay! It’s done! If we weren’t using Colby, I’d let it brown a little more than this. Colby, however, tends to dry out before it browns, and I like it to be a little more on the runny side. Take it to whatever point you feel happy with. And slop it liberally on top of it all! Now eat! 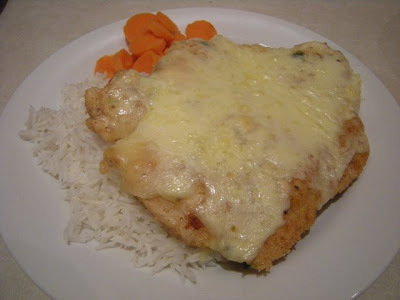 Pictures are also available in the Chicken Parmigiana Picasa album.